MecSoft Corp, a leading provider in CAM software packages, has just released an update for its SOLIDWORKS integrated CAM product VisualCAM 2017. 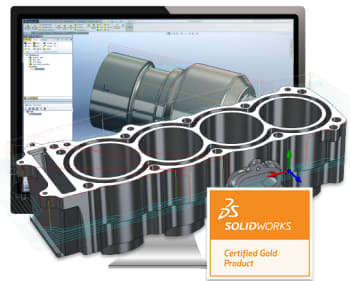 Featuring both milling and turning packages, VisualCAM is a complete CNC package that’s been awarded Dassault Systèmes’ SOLIDWORKS Certified Gold Product certification, giving users a guarantee that the software will deliver top-end performance while working seamlessly within the SOLIDWORKS user interface. While VisualCAM has been a SOLIDWORKS Certified Gold Partner for seven years, the 2017 release brings a host of new features to the CAM package. According to MecSoft, VisualCAM 2017 now comes complete with feature detection and feature-based milling options, further automating a user’s programming workflow. Outside of feature detection, VisualCAM 2017 can also identify three-axis pockets, prismatic pockets, slots, planar faces and bosses and then apply appropriate milling solutions to these different geometries. When it comes to machining methods, VisualCAM 2017 debuts four-axis drive surface milling that will improve true four-axis milling operation and a slot milling strategy that enables single-line and trochoidal machining of slots. Finally, MecSoft’s package also includes new tools, like federate slowdowns for corners, tool tip help and the ability to apply algebraic operations with all CAM dialogue boxes. To learn more about the plethora of features in VisualCAM 2017’s MILL and TURN packages, visit MecSoft’s product profile page.